This OOAK (One of a Kind) ring was inspired by vintage jewelry from my mother's jewelry box, which is filled with a cornucopia of Sara Coventry pieces and many, many other treasures. 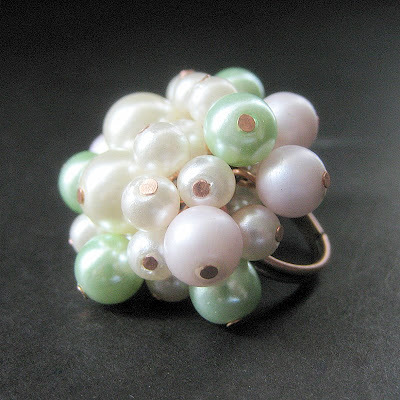 Created from a blend of all vintage pearls in shades of soft seafoam green, pale pink and white, this pearl ring is designed when they are all bunched together in a 1.3-inch (3.5 cm) cluster on an adjustable copper ring base. This beautiful pearl cocktail ring is perfect for any occasion. It has adjustable sizing from a size 6 and up, making it comfortable for the wearer no matter the size as well as ideal for switching from finger to finger depending on mood or preference. 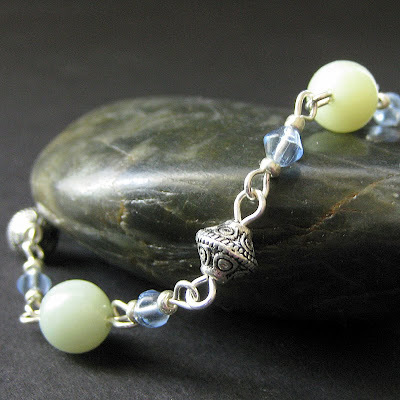 Green jade rounds are joined with shimmering faceted blue beads and silver plated accents in this handmade bracelet in which each link is hand-turned with care. Jade is one of my favorite stones to work with and is treasured in many cultures as a stone of harmony, fidelity and dreams. 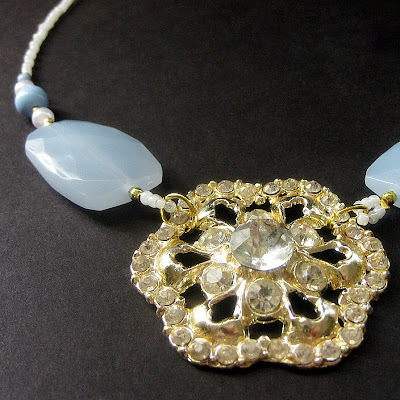 It's believed that jade can not only help improve the remembering of one's dreams, but also to help the dreamer release suppressed emotions during the dream process. In the Mayan culture, Jade was held as the "Sovereign of Harmony" and was believed to promote peace in all aspects of one's life. This 8.6" (22 cm) gemstone bracelet is finished off with a matching toggle clasp, creating the perfect accent piece for whether you want to dress up a casual outfit or accent an elegant ensemble.